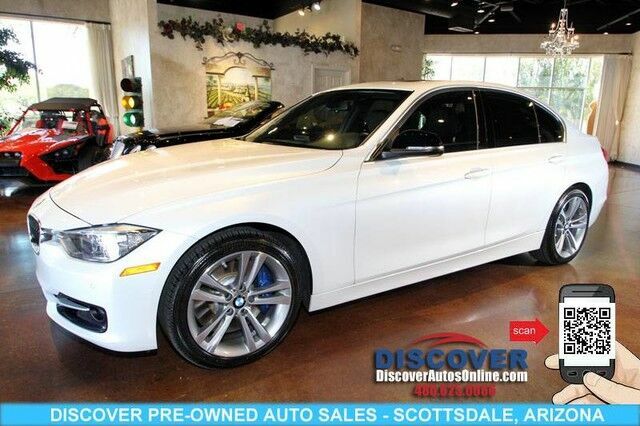 Discover Pre-Owned Auto Sales of Scottsdale Arizona is pleased to offer this beautiful 2015 BMW 3 Series 335i Sedan 4D with only 30,009 miles. This 2015 BMW 3 Series 335i comes with a CARFAX Buyback Guarantee, which means you can buy with certainty. Put performance, safety, beauty, sophistication and all the right amenities into a car, and here it is! Now you can own luxury without the luxury price tag! Start enjoying more time in your new ride and less time at the gas station with this 2015 BMW 3 Series. Drive any city's streets like you've lived there all your life using the navigation system on this BMW 3 Series. This highly refined BMW 3 Series comes with exciting features you'd expect in a vehicle twice the price. This pre-owned BMW 3 Series looks like new with a clean interior that's been well-kept. This BMW is equipped with some of the most amazing wheels the market has to offer! Once you take this BMW 3 Series 335i for a test drive, you'll instantly realize how much of an added bonus this vehicle's upgraded wheels provide. This BMW includes: PREMIUM PACKAGE HD Radio Satellite Radio Power Door Locks Keyless Entry Passenger Adjustable Lumbar Driver Adjustable Lumbar Remote Trunk Release MINERAL WHITE METALLIC POWER FRONT SEATS W/DRIVER SEAT MEMORY (STD) Seat Memory Power Passenger Seat Power Driver Seat Bucket Seats DARK BURL WALNUT WOOD INTERIOR TRIM Woodgrain Interior Trim SPORT LINE Aluminum Wheels Power Passenger Seat Power Driver Seat Bucket Seats TRANSMISSION: SPORT AUTOMATIC W/SHIFT PADDLES 8-Speed A/T Transmission w/Dual Shift Mode A/T TIRES: P225/45R18 FR Tires - Front Performance Tires - Rear Performance *Note - For third party subscriptions or services, please contact the dealer for more information. * At DiscoverAutosOnline.com , we strive to provide you with the best quality vehicles for the lowest possible price, and this BMW 3 Series 335i Sedan is no exception.